Step declines in coral reef health resulted from major coral bleaching in 1998 (25% loss) and 2016 (10% loss). This is the main finding from the latest GCRMN regional report on the state of coral reefs of the Western Indian Ocean (WIO) which was officially presented on 7 December 2017 in Nairobi, Kenya, during the 32nd General Assembly of the International Coral Reef Initiative (ICRI). In 1998, coral reefs in the Western Indian Ocean crossed a threshold, due to impact of the 1st global bleaching event in that year. On average, coral cover declined by 25% – from 40% before 1998 to 30% after 1998. 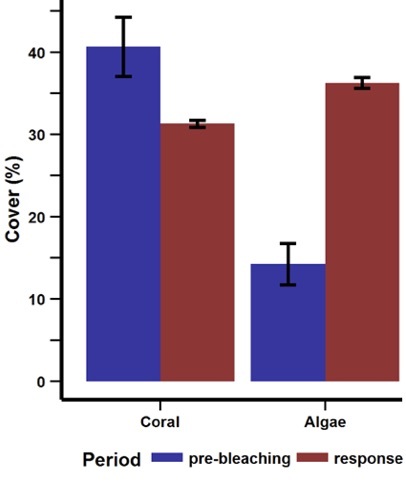 Algal cover increased by 2.5 times after 1998, from 15% before to about 35% after. 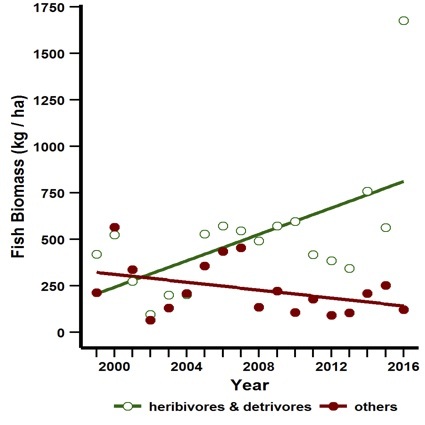 Fish community structure is now dominated (about 80% of biomass) by small-bodied herbivores and detritivores. 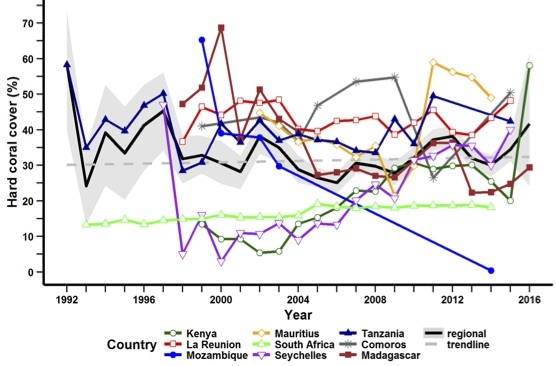 In 2016, the 3rd global bleaching event impacted the WIO, with 30% of reefs showing evidence of high or severe bleaching, but only 10% showing high or severe mortality. The threat from all major drivers of reef decline has increased and is projected to continue to increase in the coming decades – ocean warming and acidi cation, shing pressure, human population growth and development in the coastal zone, expanding global trade. 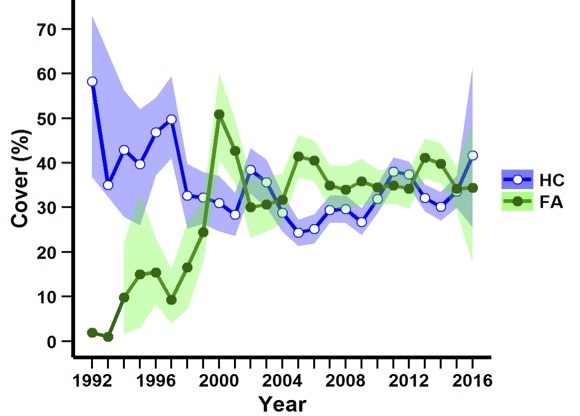 While resistance of corals to the 2016 bleaching event was signi cant (2 of affected corals recovered) and the decline in coral cover resulting from the bleaching event was less than in 1998, the recovery potential of reefs is likely to be less than in 1998 due to the lower coral cover, higher algal cover, and increasing role of algal-herbivory dynamics. The broad-based coral reef monitoring community in the Western Indian Ocean is active, but would bene t from increased investment and stability, and more secure data management and sharing practices. meet 2020 and 2030 targets will be needed to buy time for coral reefs, while countries increase their commitments to achieve the Paris Agreement. Recognizing the important socio-economic and ecological values of coral reefs and their associated ecosystems, the WIO countries (South Africa, Comoros, France / Réunion, Kenya, Madagascar, Mauritius, Mozambique, Seychelles, and Tanzania), through regional cooperation frameworks (Indian Ocean Commission, Nairobi Convention), have aligned themselves with the International Coral Reef Initiative (ICRI) in an attempt to provide solutions to help manage and maintain these systems, including a regional framework for monitoring and reporting the coral reef status through the Global Coral Monitoring Network (GCRMN).